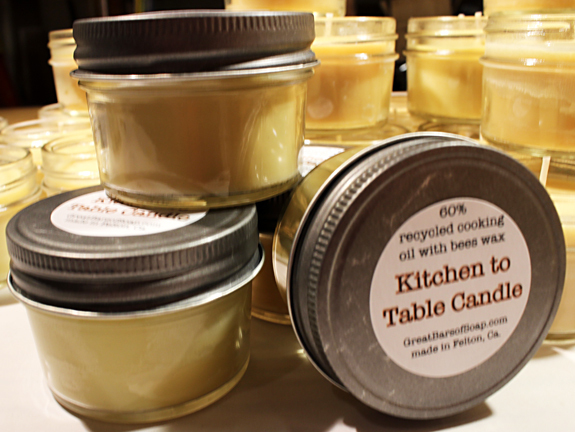 Garimo is having a new recycling idea/project - collecting and recycling used cooking oil from local restaurants, then making candles and making the finished table candles available for use on restaurant tables. The jelly jar table candles are 60% locally collected used, filtered, and repurposed restaurant cooking oil that is blended with organic bees wax. When burning the candles flame is between a half inch & one inch with a burning time of 18 to 20 hours. The table candles have no scents added and are low to no odor except for a bit of natural beeswax scent when burned. The recycled cooking oil in the candles has had only potatoes cooked in it. If your restaurant would like to repurpose some of it's kitchens oil for table candles, I'll collect some that has had no meats cooked in it and blend it with oils collected from others. My project is just starting out and won't be able to collect a lot of oil at first, and will never come close to the three billion gallons of cooking oil that is disposed of each year in the US. 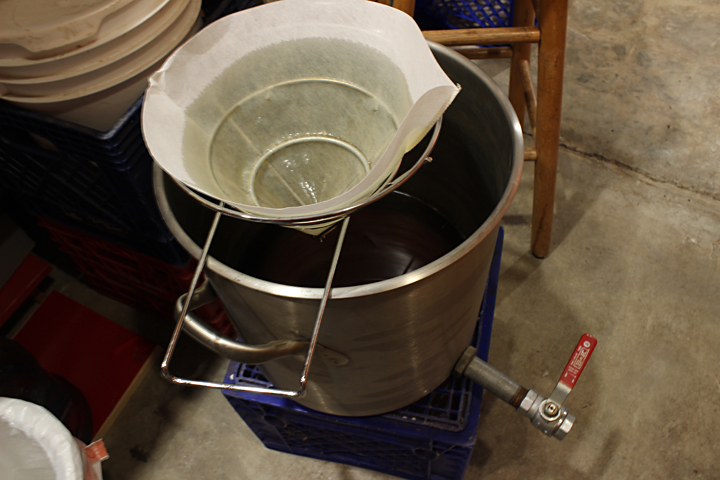 After I've collected the oil, it's strained and filtered to remove fine particles of any food. 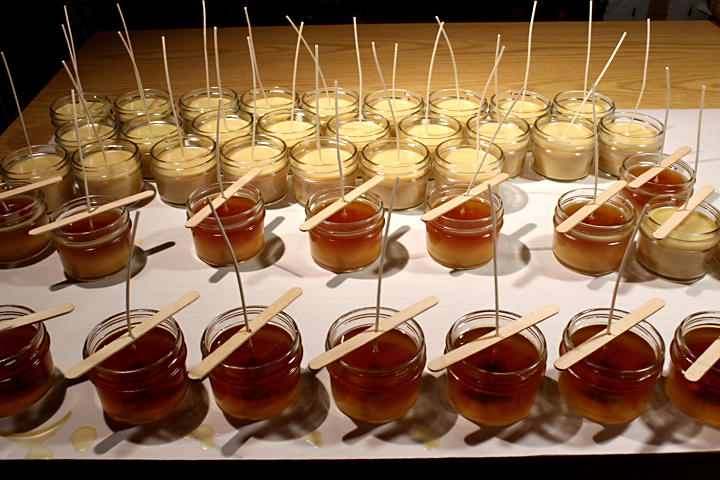 Then the oil and bees wax are combined and heated before pouring into the 4 ounce jelly jars. 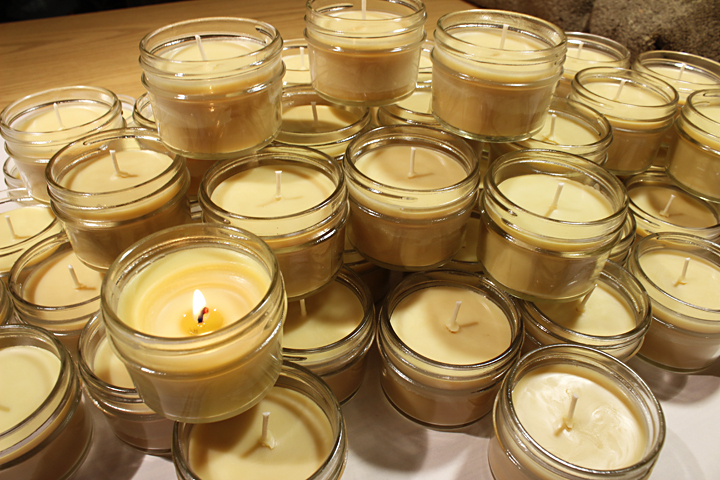 The finished voltive Table Candles are available at my Farmers Market booth when it's not raining, or by mail. $7.00 for one, $30.00 for five. I don't have postage figured out yet, so just place your order and when I have it packed and weighed, I'll send a paypal invoice for quick payment. Restaurants and other resale establishments can email me for wholesale rates. Email Garimo's Real Soap Studio and we can talk.